Dear EarthTalk: Is it true that some countries have turned over public water supplies to private companies, effectively denying local communities much-needed access? Water is such an important part of life that it has long been regarded as a public good worth entrusting only to public entities. But given the mixed track record of municipal, regional and national governments to properly manage water resources, outsourcing to private companies is becoming more common. But critics of such privatization point out that the end result for consumers is not always so positive. Perhaps the best known example transpired in Bolivia in the 1990s, when water systems in poor regions were put up for sale to private investors at the urging of development agencies intent on steering poor countries away from state control of industries and toward free market systems. Bolivia hired U.S.-based Bechtel Corporation to take over and manage water in the Cochabamba region there. Bechtel made good on its pledge to provide water to many previously underserved Cochabamba areas, but it also raised prices significantly. “Many were unable to pay such high rates, and even though water was now available to them, they couldn’t access it because they couldn’t afford it,” reports the non-profit World Savvy. Photo: Kris Krug, courtesy Flickr. Around the world, communities that can't afford to keep fresh water supplies clean, safe and accessible have increasingly turned over management to private companies. In many cases, the experiments have gone badly and local citizens have forced their governments to take back control. 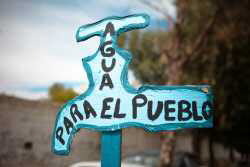 Pictured: A signpost ("Water for the People") created in Bolivia at the 10th anniversary of the Cochabamba water conflicts there, during which Bechtel Corporation was given control of water management and later forced out. In 2000 riots erupted in Cochabamba as hundreds of residents filled the streets, angry that a private, foreign entity was preventing them from accessing water. “The violence shook the confidence of the local government and international investors,” says World Savvy. “Bechtel was forced out, resulting in not only chaos in water delivery in the area, but also in a serious blow to foreign investment in the country.” Similar conflicts have played out in other parts of Bolivia as well as in Ghana, Uruguay and the United Kingdom. In the U.S., the federal government ensured the protection of waterways and drinking water in the 1970s through passage of the Clean Water Act and Safe Drinking Water Act, which among other benefits increased funding for community water systems to help cities and towns maintain high standards and inexpensive access to fresh water. “However, since the 1980s, the federal government has been cutting back funding to communities for water infrastructure, with assistance falling to historic lows under the Bush administration,” reports the non-profit Food & Water Watch. Without federal funding, communities that can’t afford to keep fresh water supplies clean and safe are increasingly turning to private companies. Not everyone thinks water privatization is all bad, especially when governments can’t efficiently manage the sourcing, sanitizing and distribution of life’s most vital resource. “There is evidence that privatization may work when the cost of water is subsidized for poorer populations,” reports World Savvy. Regardless, the debate will rage on as more and more governments turn to water privatization as stress over accessing water becomes more commonplace in a quickly warming and increasingly drought-stricken world.